The Class of 2018 saw four years on the Hill with changes to university policy and staff, impressive athletic feats and several successful campaigns of political activism. To celebrate the graduating class, the Daily has looked back and highlighted their most memorable events, policy changes and tumultuous moments. The Class of 2018’s first year on the Hill was characterized as a year of firsts for the university. In an explosive start to the year, the Tufts football team ended its infamous 31-game drought with a 24–17 season opening victory over Hamilton. The fans rushed the field following the historic win, the team’s first since 2010, and the team went on to finish 4–4 in its best season since 2008. Besides football, Tufts athletics saw other firsts. After letting up only one goal throughout the tournament, men’s soccer found itself in the NCAA Div. III National Championship game, defeating Wheaton 4–2 to take home its first national trophy. The Hill saw another record broken thanks to Boston’s snowiest winter on record, leading to a record-high five snow days and causing professors to schedule makeup classes on Patriot’s Day and the first two days of reading period. The spring also saw computer science become the first major in more than a decade to surpass international relations as the program with the most declared majors. In the spring, members of the fraternity Alpha Epsilon Pi voted to disaffiliate and formed a local fraternity, Pi Delta. Sigma Nu saw its fraternity chapter revoked after being found responsible for alcohol policy violations and hazing. In late May, a stabbing inside the Delta Tau Delta (DTD) House led to a temporary lockdown on campus and resulted in the fraternity being put on probation and losing its house for two years. It was a busy year for student activism. Student group Indict Tufts led protests against racial oppression on campus and nationwide, including a march from campus to the Harvard Bridge. Tufts Climate Action (TCA) staged a sit-in at Ballou Hall calling for Tufts to divest from the fossil fuel industry. 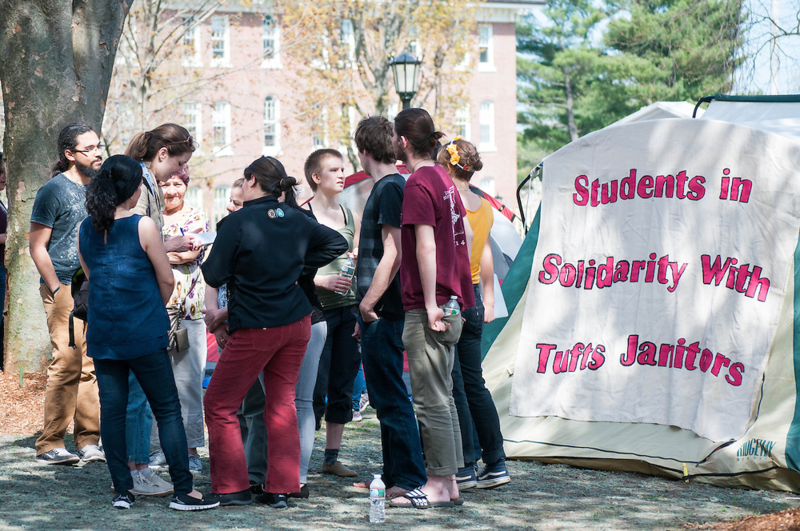 Perhaps most notably, Tufts Labor Coalition responded to the university’s efforts to downsize its janitorial services staff with a 33-hour sit-in at Ballou Hall and a five-day hunger strike and occupation by five students that made local headlines. The year ended with a new 5,000-pound bronze Jumbo statue taking its place on the Hill amid a TLC protest in support of the custodial staff. The 2015–2016 academic year was characterized by changes to academic programs, student activism and progress on several building projects. In December, University President Anthony Monaco announced the acquisition of the School of the Museum of Fine Arts (SMFA). The School of Arts and Sciences also announced a film and media studies program; a science, technology and society program; a Portuguese minor; and an Environmental Studies minor focused on food and nutrition systems. Construction on the Science and Engineering Complex (SEC) started, and Tufts continued work on the new Central Energy Plant. The university’s use of non-union construction workers for these projects sparked protests, including the use of mobile billboard trucks sponsored by the Boston Building Trades Council. Following an uncertain conclusion to TCA’s spring sit-in, activism around divestment of the university’s endowment from the fossil fuel industry continued. In November, TCA demonstrated outside of a Board of Trustees meeting, distributing letters to the trustees calling for divestment. TCA collaborated with the Tufts Office of the Provost and the Tufts Institute of the Environment to host a two-day symposium on climate change in the spring, and in May a faculty resolution was passed in favor of divestment and urging for Tufts to create a plan to reduce carbon emissions. Students marched to Porter Square in a demonstration calling for universities to more actively combat racism on campus and in their policies, as part of a “National Day of Action” organized by a group calling themselves #TheThreePercent. Organizers also released a list of demands about the treatment of black students and faculty at Tufts, calling for increased representation, an end to increased Tufts University Police Department (TUPD) surveillance of predominantly black events, increases to the Africana Center budget and more support for black, undocumented, international and first-generation students. Concerns over campus safety colored the spring. Incidents of catfishing, spiked drinks and multiple assaults led to an email from the Dean of Student Affairs detailing resources for students who have been affected by sexual violence. The end of the semester did not bring an end to safety concerns, as a car fire behind Health Services and bomb threats to several on-campus locations caused several final exams to be postponed. The election of Donald Trump to the presidency saw a rise in campus tensions and set the tone for the rest of the year. Hundreds took part in a walkout planned by Tufts United for Immigrant Justice (UIJ) to express support for Tufts’ undocumented students and call for the university to be designated a sanctuary campus. Monaco made an appearance and while he did not explicitly support the sanctuary campus movement, he read a statement reaffirming the university’s commitment to protecting its undocumented students. The day before election day, the Tufts Observer published an article detailing an act of hazing and sexual assault during a fraternity event. The piece called for the abolition of fraternities, and precipitated a campus-wide movement for the abolition of Greek life. Though participation in Greek life had risen to nearly a quarter of the student body the previous year, nearly half of the members of the Delta chapter of Alpha Omicron Pi (AOII) left the sorority early in the fall, following disagreements with the national organization over the chapter’s decision to extend a bid to a transgender woman. Chi Omega sorority also saw a drop in membership, with members criticizing the national organization and Greek life as an institution. In response to these calls, the university began investigations and placed a hold on social events and recruitment for all chapters. Labor continued to be a prominent issue. The university barely avoided a strike while negotiating janitor contracts, and also nearly faced a National Labor Relations Board hearing over unpopular schedule changes. Graduate students in the School of Arts & Sciences voted to unionize, and part-time faculty rallied to support the renegotiation of their contracts. Graduating senior Benya Kraus was elected TCU President. TCU Senate faced controversial resolutions, including an unsuccessful resolution proposed by free speech group Student Advocating for Students calling for changes to the university sexual misconduct policy and a resolution, passed 17-6-8, that called for the university to divest from companies it says are involved in the occupation of the Palestinian territories. Tufts celebrated its first Indigenous Peoples’ Day in the fall, a victory for TCU Senate which had twice passed resolutions in support of the holiday. The Hill had a number of visitors, including former Secretary of State John Kerry, “NBC Nightly News” anchor Lester Holt, Senator Tim Kaine and Massachusetts Governor Charlie Baker, whose presence provoked a protest and walkout. Even actor Matt Damon made an appearance, showing up twice at the Steve Tisch Sports and Fitness Center. At the end of the year, a group known as TuftsLeaks published documents online including department budgets, the salaries of thousands of staff and faculty and the ID numbers of student employees with salaries listed. The Class of 2018’s final year on the Hill saw Tufts make national news over the Fletcher School of Law and Diplomacy’s Board of Advisors, a conclusion to the previous year’s Greek life investigations and new directors at half of the Group of Six centers. Three weeks later, second-year MALD candidate Camilo Caballero published op-eds supporting a petition to remove former White House Communications Director Anthony Scaramucci (LA ’86) removal from the Fletcher School’s Board of Advisors. Scaramucci sent a letter threatening a defamation lawsuit and demanding a public apology as well as that the two op-eds be retracted. Scaramucci resigned the next morning. The fall also saw an end to the Greek life investigations started the previous year. One fraternity, Pi Delta, chose to dissolve rather than resolve allegations of misconduct. Two fraternities, Delta Upsilon and Zeta Psi, were suspended until September 2018. One fraternity, Theta Delta Chi, was found responsible for multiple violations of university policy and had its recognition revoked without room for appeal until 2027. Three fraternities — Pi Rho, DTD and Theta Chi — were placed on disciplinary probation. One sorority, Chi Omega, was placed on disciplinary probation until December 2018 and the other fraternities and sororities were found to be in good standing with the university. In another attempt to address the ongoing housing shortage, the university made progress on the CoHo housing project, first suggested by the Residential Strategies Working Group. The project, originally named Capen Village, was approved by the Medford Zoning Board of Appeals on Jan. 11 and will open to house juniors and seniors in the fall semester. Rising senior Jacqueline Chen won the election for TCU president against rising senior Adam Rapfogel. Senate passed a number of resolutions. One called for the pass/fail deadline to be extended to 10 weeks for all students and was affirmed by a faculty vote on Feb. 7. Senate also unanimously passed a resolution calling for the separation of the Asian American Center and Asian American identity-based housing in order to improve accessibility to the center. The Group of Six saw major changes. Hope Freeman, Julián Cancino and K. Martinez were hired as center directors for the LGBT, Latino and Women’s Centers respectively. In February, the university announced the creation of a first-generation student center, and in April, Martinez stepped down as Women’s Center director, citing hostility at Tufts on and off campus. The year saw another victory for labor activists, with dining worker voting overwhelmingly to unionize in April. The end of the year was colored with mild controversy, however, with some students expressing disappointment over the choice of former DuPont CEO and Tufts alumna Ellen J. Kullman (E ‘78) to deliver the 2018 commencement address. Kullman faced criticisms over violations of environmental regulations that occurred during her tenure as CEO.